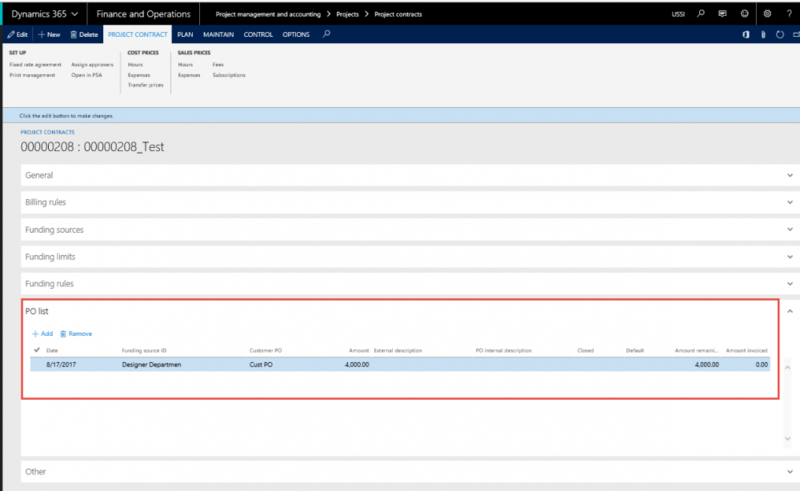 *This sections details out the setups required to configure for the Customer Purchase Order matching. On Projects+ parameter form, under Invoicing tab, a new parameter “Customer PO Matching” has been introduced to control the customer PO matching feature. When the user makes the value of this checkbox as ‘Yes’, the customer PO Matching is activated. Customer PO can be created in the PO List Fast Tab that has been added newly for this feature in the Project contract form. The user can add as many Customer PO lines as required per funding source. However, per funding source only one PO can be set as default, for the PO to default onto the invoice. Once there is an approved Invoice proposal attached to a Customer PO line, then the Customer PO record cannot be deleted. Go to Project management and accounting > Projects > Project Contracts > PO List. Date The user can update the Customer PO date in this field. Funding source ID Identification of the funding source. Customer PO This is an alpha numeric field, where the user can enter the Customer PO references that will be used on the invoice proposal and invoice. Amount The total amount of the Customer PO is entered in this field. External description This is a description field where in the user can enter details which are received from the customer. PO Internal description This is also a description field where the user can enter notes/description internal to the organization such as project details, cost centers, etc. Closed Selecting this check box will eliminate the usage of the related PO in the invoice proposal form and can be used only after the check box is cleared. Default Selecting this check box will make the PO reference default in the invoice proposal form Customer PO field. At any point in time only one line can be marked as a default Customer PO. Amount remaining The amount remaining to be invoiced out of the total amount is shown in this field (i.e. Amount – Amount invoiced). Amount Invoiced The total of all invoices posted with the Customer reference relating to the line is shown in this field.